Join the Smith Family & Luci Staff throughout the month of May as we tour the Veneto! A few miles east of Verona, enclosed by the original town walls and dominated by its medieval fortress, the ancient commune of Soave has a peaceful, timeless quality about it. In the heart of the old town is the home of the Pieropans, the historical Palazzo Pullici, built in 1460 and purchased by the village doctor and amateur winemaker, Leonildo Pieropan, Senior, in 1890. Leonildo, Sr. obviously had a genius for the winery: his cantina not only thrived, but its founder even ‘invented’ Recioto di Soave. Today his grandson, Leonildo (“Nino”) Pieropan, flanked by his wife, Teresita, and sons, Andrea and Dario, are showing the world just how great Soave can be in the right hands. This classic DOC Soave Classico is comprised of 85% Garganega and 15% Trebbiano di Soave from southerly exposed hillside vineyards. The wine matures in glass lined cement vats and rest at least one month in the bottle before release. Brilliant straw yellow, ample, delicate nose of almond and cherry blossoms, elderberries and lilies of the valley; complex and structured on the palate, with good acidity, silky texture, almondy finish. At Luci Restaurants: Great with Fresh Mozzarella, Pesto, and Scallops. The viticulture story of the Tessari family began in the early 1900’s when Amedeo Tessari, rented an osteria in a small area of Albaredo d’Adige. After Amedeo’s passing on the day of the 1918 armistice, Amedeo’s wife, Donna Adele raised their children until the 1930’s when their son Fulvio, known as “Beo” took over the family’s business. Fulvio continued his father’s plans, focusing on viticulture, purchasing the most prestigious vineyards of Rugate, making wine and selling their grapes. In the 1970’s. Fulvio decided to improve upon this foundation and formed Azienda Agricola TessariFulvio, the estate preceeding Ca’Rugate. With his son, Amedeo, the family lands were brought together in the “fermentation years,” distilling the wine making practices and crossing national borders with only Garganega production. In 2001, Michele began carrying on as the fourth generation of grape growers. The Tessaris made the decision to build a new, larger and technologically advanced cellar. In the same year, the family decided to invest their experience in the Valpolicella area by purchasing the first vineyards in the hilly zone of Montecchia di Crosara. This Valpolicella marks the beginning of a new chapter for Ca’Rugate with the Rio Albo offering 40% Corvina , 30% Rondinella, 30% Corvinone. Fermented on the skins for a period of 7 to 10 days and matured in stainless steel tanks, this ruby red brings a bouquet of blackberry and cherries to a supple palate with light tannins and plenty of flavour. Ideal with grilled or roast chicken and pork and delicious with tasty hard cheeses. 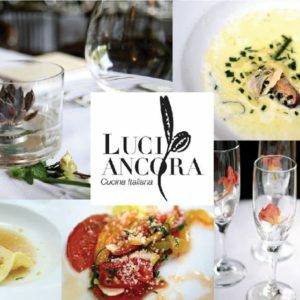 At Luci Restaurants Beautiful with our Duroc Pork, Daily Fish, and Polenta.